The maximum cash out from this bonus is $/€100. Bonza Spins Casino has an attractive, but simple and easy-to-navigate website design. Although it is silent about ownership and licensing, the online casino bears the SSL secured seal. Players should be above 18 to play for real money. The online casino supports responsible gambling and encourages customers to play within their bankroll limits. It also advises players to use Internet filtering services such as Cybersitter or Netnanny to protect minors from gambling content online. Ready for us to unveil to you a casino promotion like nothing you’ve ever come across before? This promo has been aptly titled “Big Mobs of Spins” and that is exactly what you can expect! A truck load of free spins offered on a weekly basis by Bonza Spins casino. Click here for more casino bonuses and promotions news. Bonza Spins Casino operates on a browser-based software platform that can easily integrate third party gaming content and is compatible with multiple devices. The online casino has partnered with numerous game providers to give players an impressive portfolio of thousands of slots, table games, and card games. The online casino displays its game library on its homepage. Players can filter games according to popularity, date of release, game type, and alphabetic order. They can view games in grid or list form. If they have any particular title in mind, they can easily find it using the search symbol. Popular GamesGames such as Sugar Skulls, Koi Gate, Cash Camel, Hot Shots, Queen of Dragons, and 88 Dragon are some of the most popular games. New GamesThe online casino has recently introduced games such as Kamchatka, Wild 888, Vegas VIP Gold, Hot Spin, and Dragon Riches. Table GamesThe library includes several table games such as Turbo Poker, American Poker V, Double Poker, Three Cards, and Caribbean Beach Poker. Video Slots The video slots at Bonza Spins Casino come with excellent graphics and lucrative features. Choose from video slots such as Gold Miners, Sugar Skulls, Royal Fruits, Fruit Cocktail 7, and Aztec Pyramids. Bonza Spins Casino supports real money play on a number of mobile devices, including smartphones and tablets. Supported mobile platforms include iOS, Android and numerous others. Players don't have to download any native app or software program because the mobile gaming software is browser-based and developed with HTML5 technology. They can easily load the games on their mobile device browsers and play them for fun or real money. Getting started is as simple as visiting the online casino on the mobile device browser and logging in to one's gaming account using existing desktop casino details. Once logged in, players can visit the game lobby and tap on any game of their choice to load it on their browser. The mobile gaming experience is just as good as the desktop version. 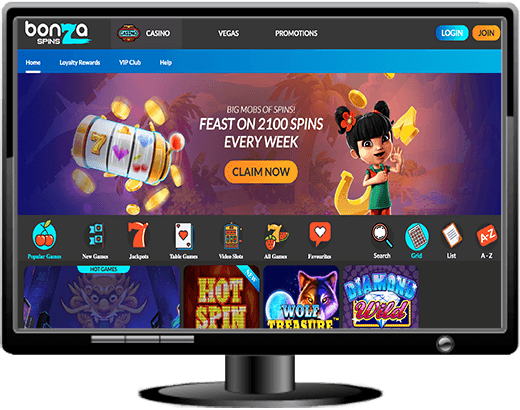 Players can not only play for fun or real money, but also make deposits and withdrawals, claim free spin offers, and participate in the online casino's VIP Program. The online casino offers a selection of 25 progressive jackpot games. If players spin the reels of these slots, they stand the chance of winning hundreds and thousands of dollars. Currently, Absolute Super Reels, Mona Lisa Jewels, Ultimate Super Reels, Neon Reels, and Super Lucky Reels have the biggest jackpots. The online casino specialises in free spin offers, giving players the opportunity to grab plenty of free spins on different games. Another exciting feature of the online casino is its loyalty rewards and VIP Club. 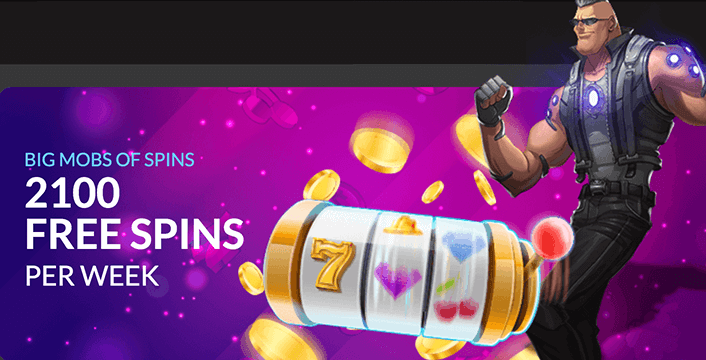 Free SpinsPlayers can claim up to 2100 free spins per week, 300 free spins per day, and 30 free spins on every deposit of $25 they make at the online casino. Free spins winnings are considered to be bonus money with a wagering requirement of 35x. VIP ClubThe online casino rewards players with points whenever they wager real money on the games. Players can later redeem these points for bonus cash. They can also achieve VIP levels based on the number of points they earn through real money play. Depending on the level achieved, players can claim benefits such as faster reward points accumulation and special bonuses and offers. Bonza Spins Casino is home to a Frequently Asked Questions (FAQ) page that provides basic information regarding registration, gaming, security, banking, and legalities. Usually, new players find all the required information to get started at the online casino on the FAQ page. Live Chat: Use the blue Let's Chat button to instantly get in touch with a customer support agent. Email: Email your doubts, questions, and problems to support@bonzaspins.com and get a prompt, customised response. Bonza Spins offers a variety of safe, secure, and reliable banking methods. All the above-mentioned payment methods are available on the mobile casino as well. Players can withdraw their winnings using the above-mentioned methods free of charge. To make a withdrawal, players have to first login, visit the dashboard, and choose the banking option. Then they have to select their withdrawal method and follow the online prompts. Players can withdraw a minimum of A$50. Since the online casino does not impose any maximum limit, players can withdraw as much as they can from their accounts. However, they cannot withdraw more than A$5000 per transaction. The online casino processes a maximum of A$10,000 every 10 banking days. Whenever players make a withdrawal request, the online casino will put it in pending state for 48 hours. During this time, the online casino verifies player details. Players have to send copies of documents that prove their identity to the online casino. These documents include government-issued photo IDs, fronts/backs of credit cards, and latest utility bills. During the "pending" period, players can withdraw their request and reverse the funds to their accounts. If players win progressive jackpots or jackpots worth more than AUD5000, the online casino has to verify the winnings with the game provider. This may take up to seven working days. VisaProcessing time-frame after approval is 0-3 working days. UPayCardThe online casino processes UPayCard requests instantly after approval. Bank TransferThe processing time-frame after approval is 0 - 5 working days. Bonza Spins is a multi-vendor online casino that specialises in developing free spins offers. Players who love free spins will never regret signing up at Bonza Spins Casino. The online casino offers 150 free spins on players' first deposits and challenges them to claim 30 free spins every time they make a deposit. Players can also claim rewards being loyal to the online casino and playing real money games. Help is just a click away at Bonza Spins. Players can contact customer support through live help or email. They can also check out a comprehensive FAQ to get the required information.